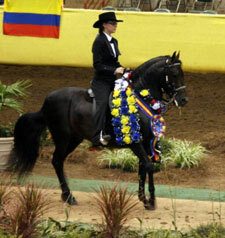 MGM Paso Finos LLC is proud to present the beautiful dark bay Paso Fino stallion, Toledo del Zipa. This drop dead gorgeous, solid dark bay stallion was purchased from the Besilu Collection in 2009. His noble presence, beautiful confirmation, powerful rear hocks and very low hands in front make this stallion the complete package. In addition, his beautiful face and soft eye will grab your heart. Call Today to Book Your Breeding for the 2009 Breeding Season!